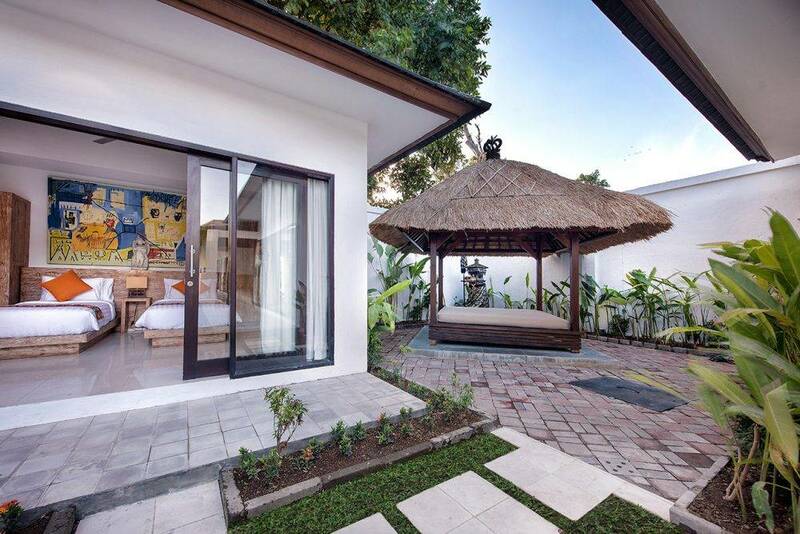 Bali Villa 366 is tucked away in the heart of the Petitenget area, close to Seminyak on Bali’s south-western coast. 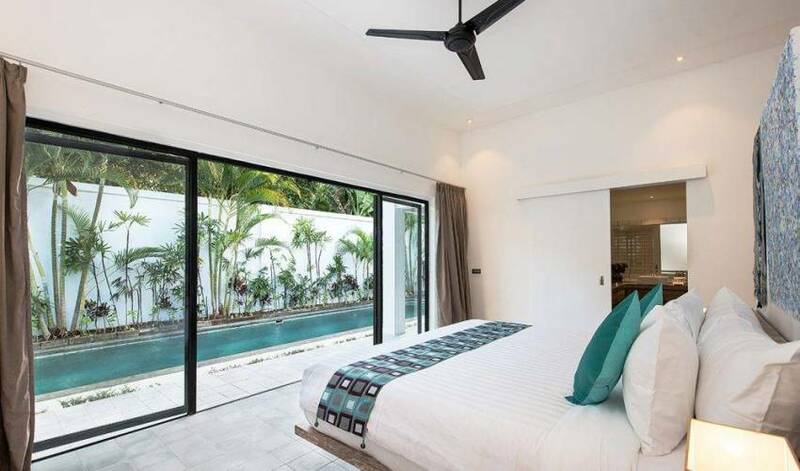 The single-storey contemporary villa presents three bedrooms with en-suite bathrooms, a 12 x 3 metre lap pool, an outdoor living space, a semi open-air living and dining room, a kitchen, and a relaxation pavilion set within a compact walled garden. The style is simple and minimalist, presenting clean lines, fresh décor and privacy. The villa is equipped with WiFi Internet access and numerous other thoughtful considerations for the comfort of the guests. The artwork includes a number of contemporary paintings and antique sculptures lovingly collected by the owner from the East Nusa Tenggara islands of Indonesia. 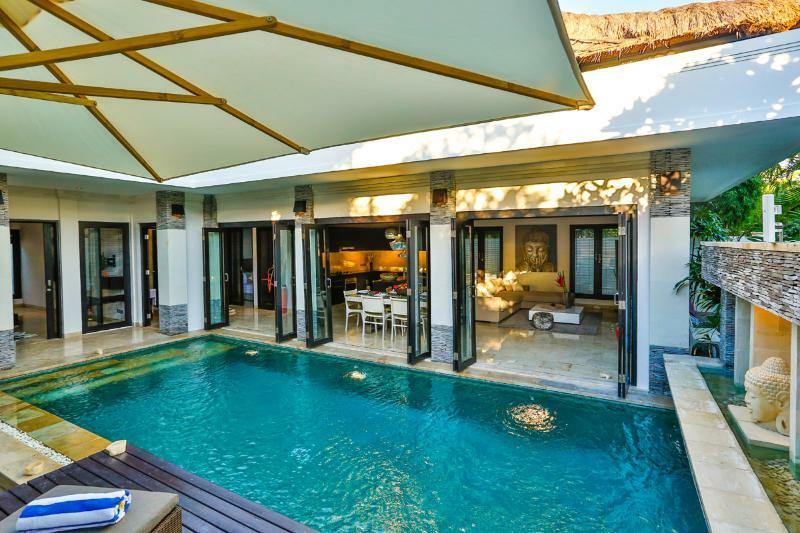 Villa 366 is a single-storey, three-bedroom villa, complete with a 12 x 3 metre lap pool, hidden in the heart of the Petitenget area on Bali’s south-western coast. 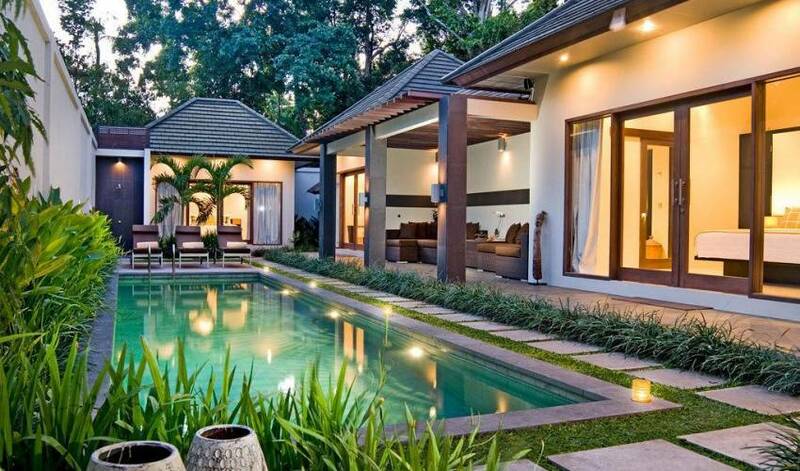 The villa is comprised of two buildings and a relaxation pavilion set within a compact walled garden planted with heliconia and palms. The style is simple and minimalist, characterised by clean lines, fresh décor and privacy. The colour scheme is chocolate and coffee, with crisp white walls displaying some colourful local artwork. The villa is equipped with WiFi Internet access and numerous other thoughtful considerations for the comfort of the guests. 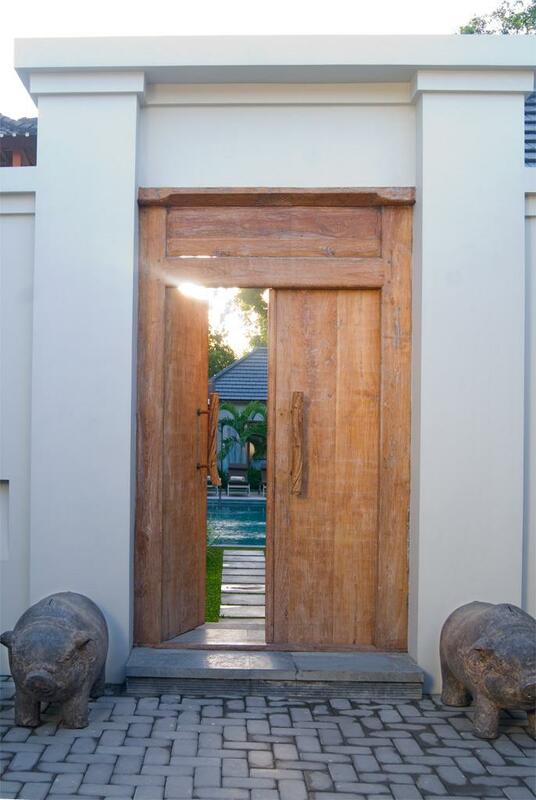 The entrance is marked by a rustic wooden door, and the artwork includes antique sculptures lovingly collected by the owner from the East Nusa Tenggara islands of Indonesia. 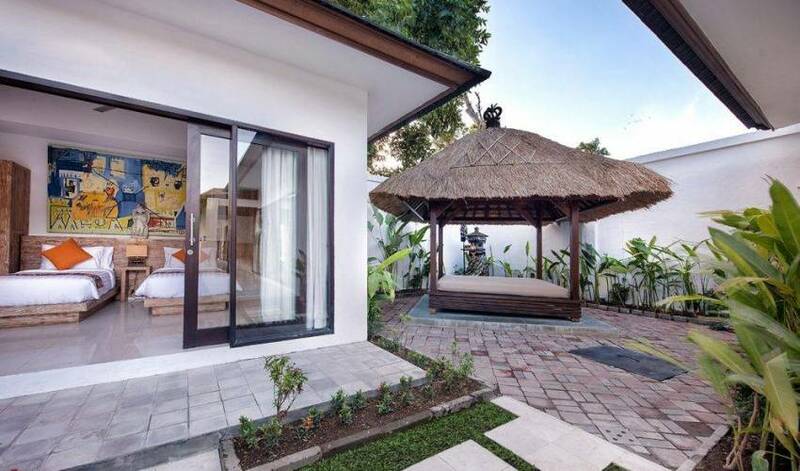 Bali Villa 366 is a mere twenty-five minutes' drive from the airport, and is conveniently located for all of the main shops, tourist attractions and vibrant nightspots. 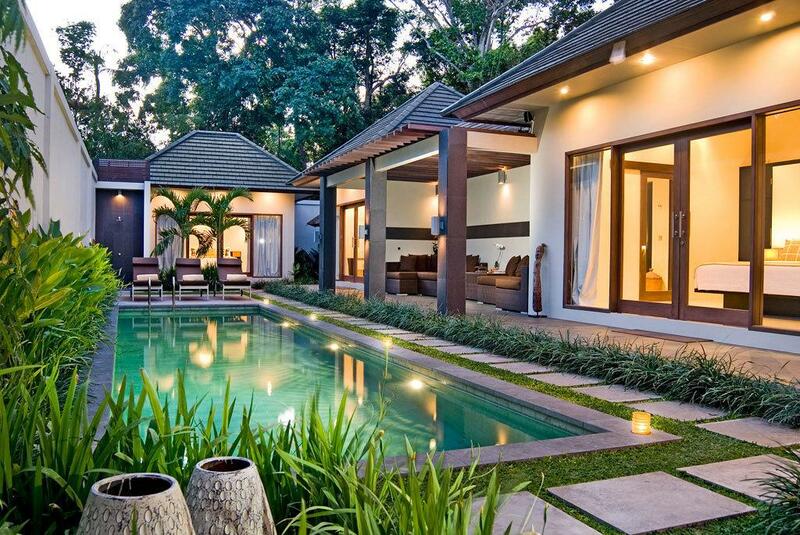 The villa is just a few minutes’ walk from a wide choice of internationally acclaimed restaurants, including the famous Ku Dé Ta, Hu’u Bar, Living Room and La Lucciola. 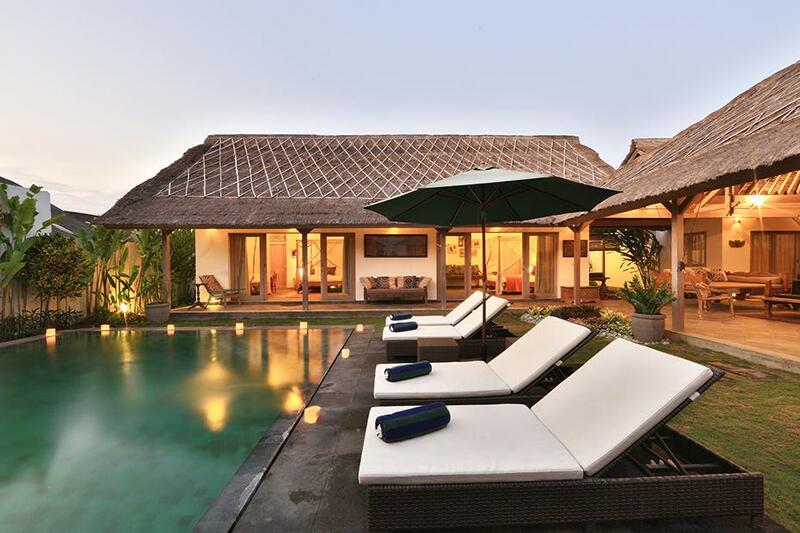 It is also within walking distance of a collection of designer boutiques, and only one kilometre from the magnificent Seminyak beach, renowned for its world-class surf breaks, panoramic coastline views and legendary sunsets. 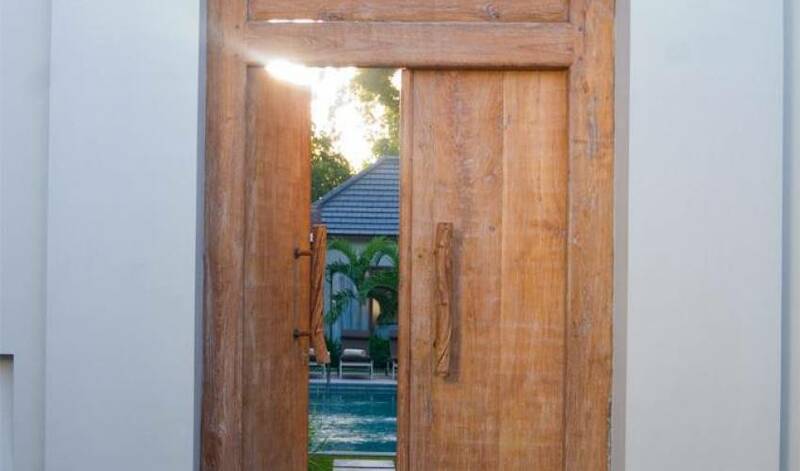 All three of the bedrooms are located poolside, and each is complemented by a private en-suite bathroom. Two of the bedrooms form part of the main building, and the third bedroom rests within its own self-contained pavilion. 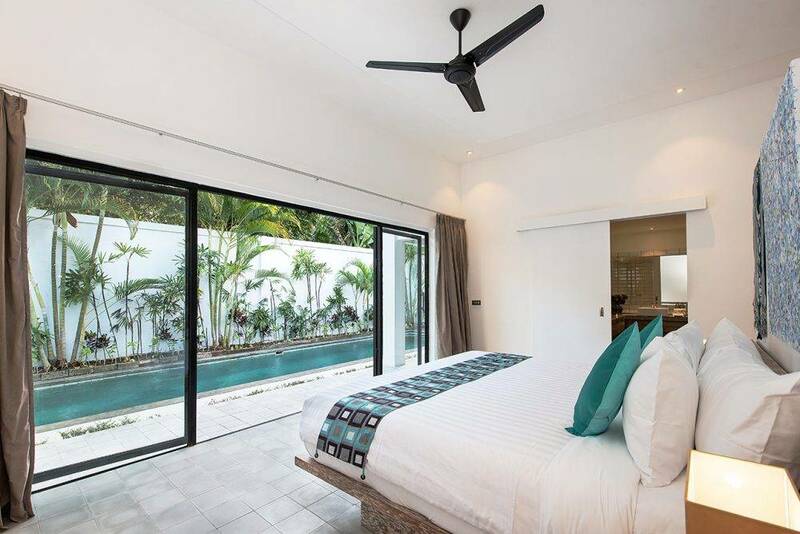 Each bedroom is accessed from the garden via sliding glass doors, and each features a cool tiled floor, discreet ceiling lights, air-conditioning and the additional provision of a ceiling fan. Contemporary furnishings in each room include custom built king-size beds, bedside tables and lamps, floor to ceiling curtains, full length mirrors, desks and comfy chairs. In two of the bedrooms, a dressing area is located behind the bed and completed by a wall of fitted wardrobes, shelves and drawers, fashioned in stylish dark wood. The third bedroom is also well equipped with a wardrobe and storage space. 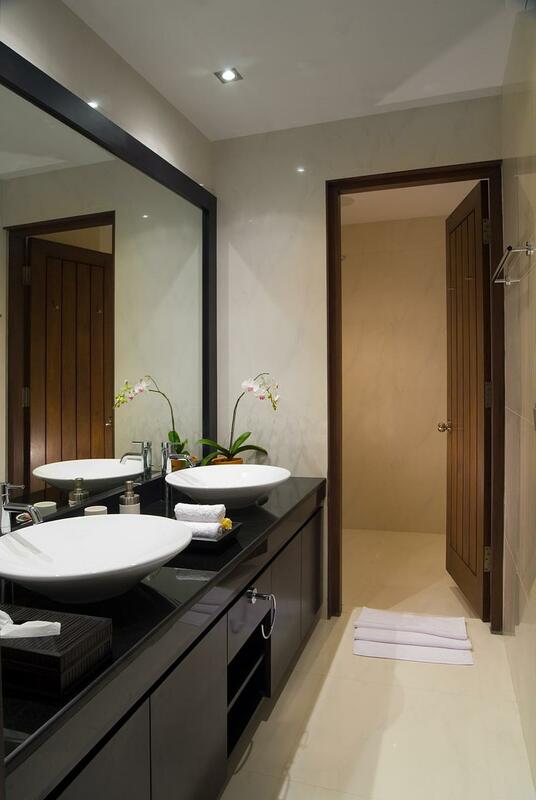 Adjacent bathrooms follow a chic black and white theme, and are accessed from the bedrooms via sliding glass doors. Each is fitted with a bathtub, a black marble vanity unit and white ceramic washbasins. Two of the bathrooms present twin washbasins. Toilets and rain showers are hidden separately behind private doors within each bathroom, and are fitted with extractor fans. 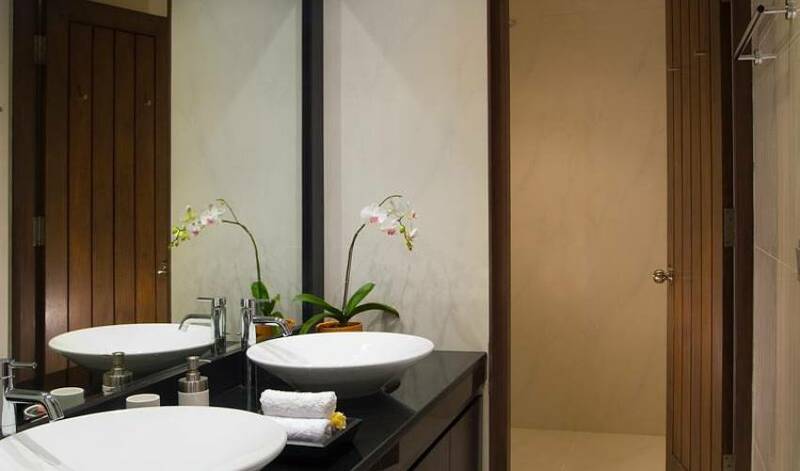 One of bathrooms boasts a rain shower that is open to the sky; it is encompassed by fluted grey granite walls and a matching non-slip floor, and is fitted with a fly screen overhead for the comfort of the guests. 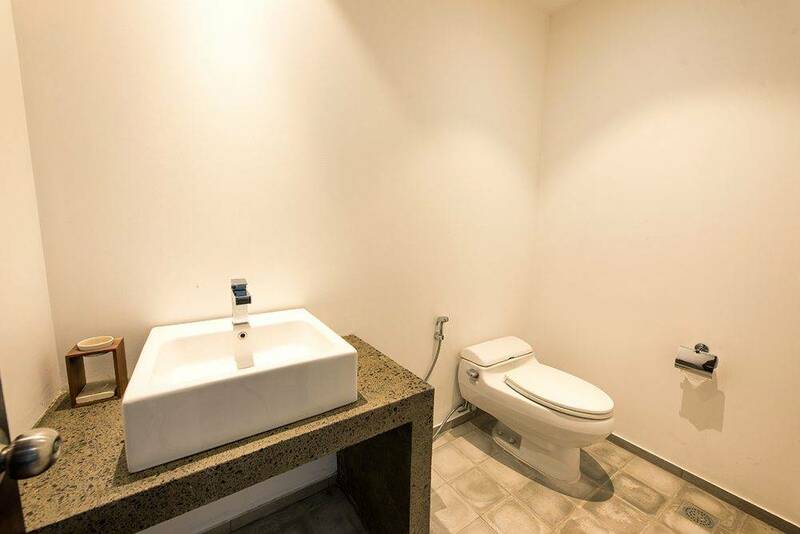 The other two bathrooms feature indoor rain showers positioned within spacious cubicles attractively finished with mosaic tiled splash backs. The 12 x 3 metre lap pool runs the length of the walled garden, and is directly accessed from each of the bedrooms and living areas. The pool is 1.6 metres deep throughout, and is flanked by an ironwood sundeck at one end, furnished with three sun beds. No chemicals are used in the pool; instead it employs an advanced ioniser filter system that is soft on the earth and gentle on the skin. 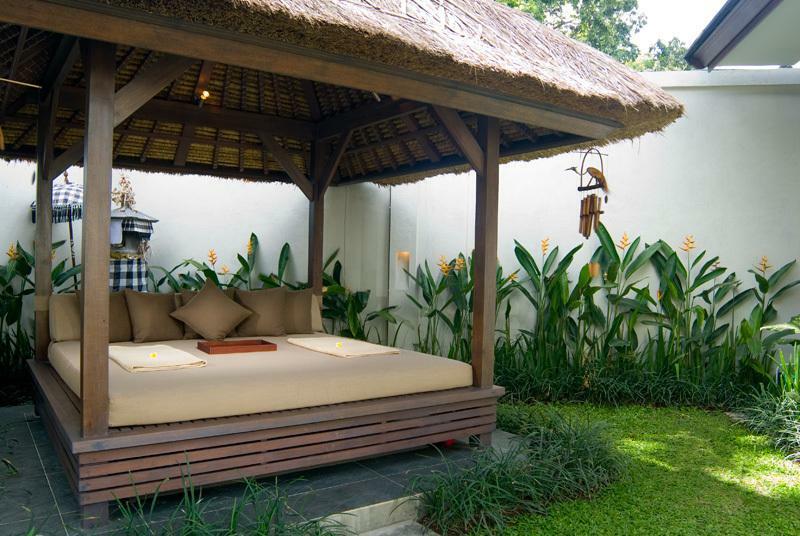 A romantic wooden bale is tucked away in a private corner; this open-sided relaxation pavilion is characterised by a raised floor furnished with a large mattress and cushions under a thatched roof. It is fitted with an electric fan, lights and music speakers. This is another lovely spot for chilling out with a book, or enjoying an afternoon cocktail. The semi open-air living and dining room is cooled by natural breezes and ceiling fans. The living area is tastefully furnished with comfortable sofas, ottomans, floor rugs, and modern white storage units. It is equipped with a 39-inch, LCD, flat screen, satellite TV, together with a DVD/CD player and quality sound speakers. Resting in pride of place is the villa’s namesake, a 19th century carved marble angel from Timor. 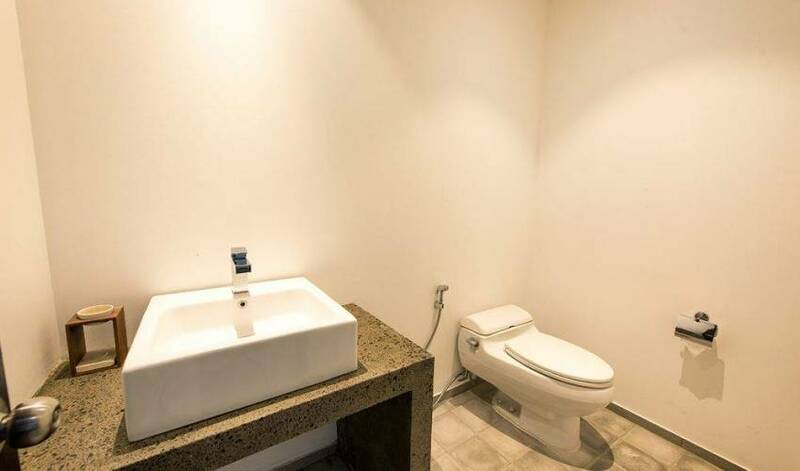 A guest washroom is situated off the living room. The kitchen is a dream in black and white, with mosaic tiles, a marble worktop, a large cooker and a hob. There is also a ceiling fan. Fully equipped with microwave, juicer, electrical gadgets and utensils, the kitchen provides everything that the staff needs in order to prepare delicious meals. It is actually two kitchens in one, boasting a wet and a dry area. The provision of a separate staff entrance ensures that guests’ privacy is never disturbed. The staff also uses a separate and discreet route around the back of the property. The staff quarters are out of sight and include a laundry and a generator. *Rates are subject to a further 10% government and 5% service tax per night.